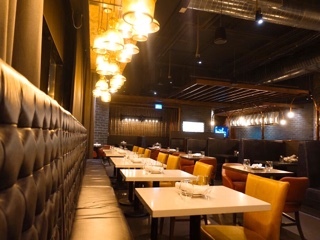 The Landing Group only started in 2010 and already has amassed eight locations across the GTA. Their newest addition, dubbed the “Centre Ice” location (thanks to their proximity to the Air Canada Centre), opens on August 23, 2017. 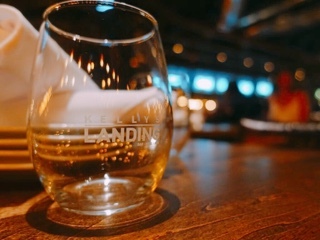 Like the rest of the chain, the Kelly’s Landing pad is large and spacious offering an extensive menu that makes choosing difficult. Steve Pelton, CEO of the Landing Group, notes that while they know they can’t please everyone, they’ll try their best to do so. During a sneak peek event, we tried a number of items, prior to Kelly’s Landing official opening. True to form, the dishes were very different. 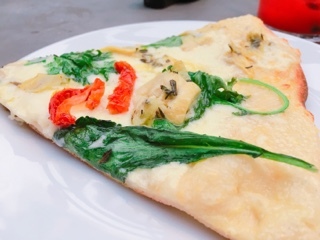 Of course, there’s pizza, a perennial crowd favourite. 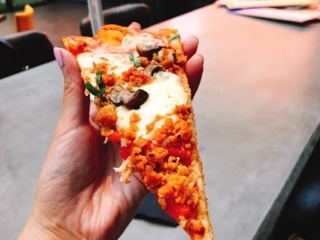 Of the three styles, I was most surprised with the sausage picante ($18), a flavourful concoction combining spicy tomato sauce, house-made spicy Italian fennel sausage, roasted peppers, and mushroom. Generally, I find sausage pizzas too heavy, but theirs was not oily so the crust remained dry and crispy. Moreover, the meat added just enough to taste without being too salty. The artichoke and cheese ($16) is what I’d normally order. 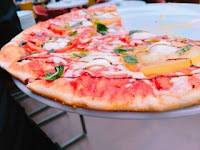 The pizza is rich and creamy thanks to the parmesan asiago cream sauce and goat cheese with mozzarella mixture on top. Other ingredients are kept simple with slightly tangy marinated artichokes, sundried tomato, and baby kale; items that help balance the dish. Meanwhile, Mamma’s margarita pizza ($15) is the opposite – light and juicy with a bit of sweetness from the balsamic syrup. You’ll be tempted to share an order of the brisket mac ‘n’ cheese ($11), which takes aged cheddar pasta and tops it with brisket that’s gone through a 10-day brine and 14-hr smoke. Imagine the most intense smoky bacon with a light heat (care of the poblano barbeque sauce), mixed with creamy pasta… how can you resist? As the Beer Sisters taught me, creamy foods pair well with beer since the carbonation in the drink helps to cleanse the palette; a dish like mac ‘n’ cheese goes nicely with a light one. Coincidently, Kelly’s Landing has a ‘Beyond the Beer’ program where 50 cents from the sale of a draft Dos Equis gets donated to the University Health Network (operates hospitals such as Toronto Western and Toronto General). Now you can have your beer and help others too. Two dishes that wowed me at the tasting were the Moroccan curried chicken ($20) and turkey burger ($16). The Moroccan curry incorporates a great blend of North African spices so the sauce actually has a strong hit of spices - full-flavoured and slightly spicy. 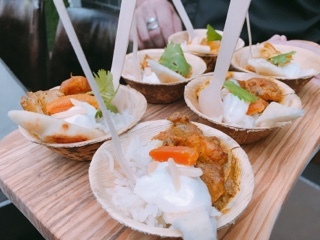 It comes with fragrant basmati rice, flatbread, and some cooling crema that helps stave off any heat. 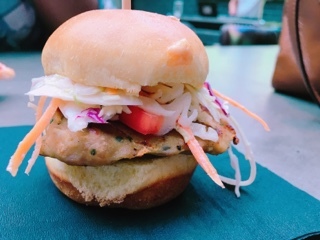 While the turkey burger ($16) is less exotic, it’s remarkably good thanks to the granny smith apples and herbs mixed into the patty for flavour and moisture. There’s a bit of spice from the chipotle aioli that’s balanced by a creamy Napa cabbage slaw, no boring burger here. 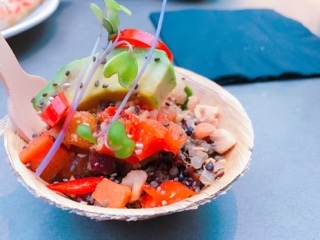 For vegans, Kelly’s Landing offers the Righteous Greens ($19) a mix of quinoa, brown barley, kale, roasted yams, avocado, vegetables, chia seeds, and cashews all tossed in a lime ginger sauce and topped with chili slices. It’s a hefty filling salad with sweet, salty, savoury, and spicy flavours giving the dish a Thai flare without tasting like a traditional Thai dish. 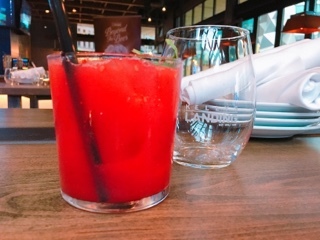 The Honey Smash cocktail ($13) is summery and sipping friendly, comprised of Absolut vodka mixed with strawberry and raspberry purée topped with mint. Touted as their take on a daiquiri, I find the cocktail is much smoother and you can taste the berries without the scratchiness of ice crystals mixed throughout. 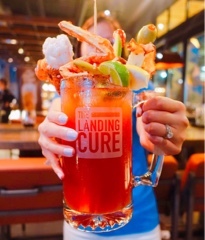 During brunch (Saturday and Sunday from 11am – 3pm) you can get the Landing Cure ($16), a monstrous Caesar topped with a lobster tail, pizza slice, jalapeno Havarti and bacon skewer, celery, carrots, vegetable skewer, and an extreme green bean pickle. Good luck walking out hungry. Aside from the traditional beer (24 options on tap), cocktail, and wine options, Kelly’s Landing also offers an extensive list of spirits. In fact, there’s a good choice for scotch lovers at various price points. 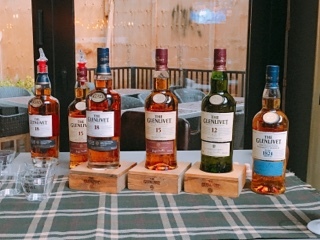 During the opening event, Glenlivet was on hand and I conducted a blind taste test to see if age actually matters. As it turns out, the older scotches definitely have less of a burn, but after a certain point it’s all pretty smooth. Personally, I preferred the 15 to the 18 year ($18/oz) as it’s an easy going drink. However, for people who like a drier peppery bite, the 18 year old definitely has those flavours thanks to being aged in bourbon and sherry casks. A more price conscious offering is the Glenlivet Founder's Reserve ($10/oz) that has an amazing oaky aroma but harsher bite. 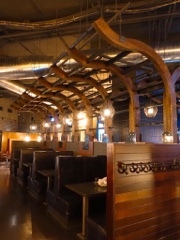 With their 43' x 30' retractable roof and spacious patio, you know Kelly’s Landing is going to be popular with the downtown crowd and packed during games. Luckily, they accept reservations (even on their patio), which seems to be an anomaly amongst the newer restaurants opening downtown. I’m already excited to return for food and liberations and to try out the patio. Go soon, while the summer’s still upon us. 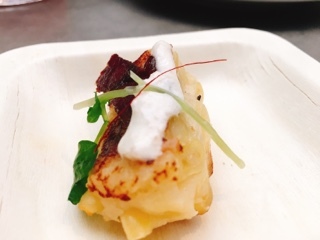 Disclaimer: I tasted the food and drinks noted above at a media event. Rest assured, as noted in my mission statement, I will always provide an honest opinion.